Ask any of my loved ones what to buy me as a gift and they’ll say, “Who cares? She’s gonna return it anyway!” You could say I’ve garnered somewhat of a reputation as a habitual returner. But hey, if I’m not gonna really use something and love it, why not exchange it for something I will? It’s not like I don’t appreciate the thought that went into it, I’m just a…perfectionist? Uptight? Something like that. This has all panned out with me receiving lots of gift cards for every holiday. Tons. And that’s fine by me, I love to pick out my own stuff, but then I’m left with all these plastic cards with $0.01 left on them. There’s nothing sadder than a dead giftcard, in my opinion. Until now! Amy from Greenmumtotes was kind enough to share her secret for creating beauty out of them. 1. 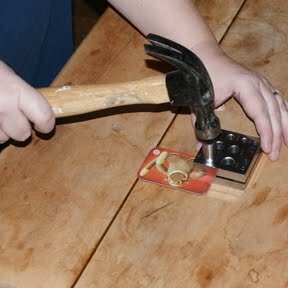 Using the hammer and the jewelry punch, make as many discs as you need for the bracelet. 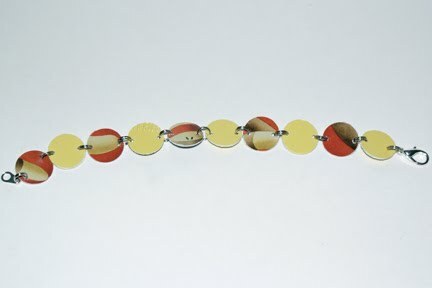 10 discs will make a 7″-7.5″ bracelet. 2. Punch 2 holes in each disc. 3. 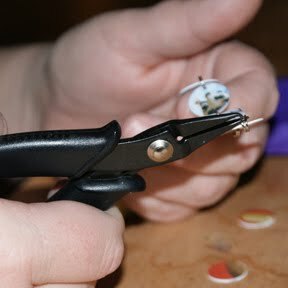 Use the split rings, split ring pliers and needle-nose pliers to connect your discs. 5. 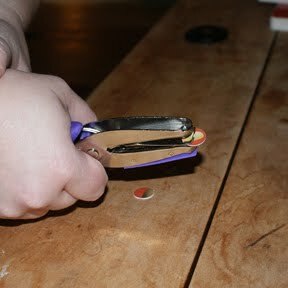 Use the nail file to smooth the edges if necessary. Voila! You can also find these bracelets (and much more!) on the Greenmumtotes Etsy store. This is the best way to save some of the cards and make something out of it– and may I add that its quite fashionable especially if you are going to use good colors.